Is AT&T Embracing Android as an iPhone Hedge? Though it is easy to fixate one's attention on Verizon finally getting its hands on the iPhone, one must not forget the fact that AT&T is going to be significantly impacted by the loss of exclusivity. Initial estimates say that between one and six million AT&T customers will jump ship, but one should not be foolish enough to think that the national carrier does not have a plan to attract subscribers. What exactly is AT&T's crutch? Android-powered smartphones, and a whole lot of them. The Verizon-Apple iPhone deal could quite possibly be good for AT&T. Not only are they now free to diversify their portfolio to stand out, perhaps bringing forth more significant advertising campaigns for successes like Windows Phone 7 and proving that they have the best Android devices on the market. The carrier announced three significant devices at the Consumer Electronics Show that will help it attain its goal of maintaining the same subscription base post-Verizon iPhone launch: The Motorola Atrix, Samsung Infuse 4G and HTC Inspire 4G. While there has been an increased saturation in Android-powered handsets in AT&T's lineup over the past few years, it seems as if this is the first cohesive line of Android devices specifically targeted at certain groups. Why is this relevant? Because AT&T is beginning to compete internally, meaning that executives want you to think about which AT&T device you would like to use. In the past few years, the answer has simply been that if you wanted a smartphone with a satisfactory UI you would buy the iPhone, but now that it is no longer exclusive, AT&T has an incentive to market other handsets that will legitimately compete with Verizon. What separates the three aforementioned gadgets from the pack? The Motorola Atrix is specifically targeted at very mobile computer users that do not necessarily want to spring for a netbook or a tablet. Motorola successfully embodied this goal by including a keyboard dock that allows it to function as if it were a full computer. With a dual core processor under the hood, and AT&T's HSPA+ network on top, it is certainly going to be a top pick for urban commuters and on-the-go bloggers. The HTC Inspire 4G is targeted at a completely different market – young socialites with eyes set on entertainment and style. The phone features HTC's Sense UI, which is significantly more friendly to users than the bare Android experience. The Inspire 4G also includes a 4.3-inch touchscreen, meaning that it is perfect for entertainment junkies on the go. 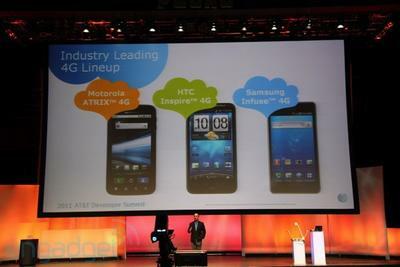 To round out their lineup, AT&T announced the mammoth Infuse 4G, which sports a whopping 4.5″ AMOLED display, sparking debates of its practicality. However, it certainly is impressive on the graphics front, targeted at a more specific audience than the other two devices, business users desiring a visually immersive experience on an Android handset. Android has also been growing significantly faster than the iPhone, meaning that as the iPhone grows more stale in the minds of consumers (note the fact that the OS will not see a significant refresh until June, at best), Android grows more relevant. It seems like it's almost everyday that Google releases a new dessert-named version of their mobile operating system, and now it poses a legitimate threat to the supposed supremacy of the iPhone. If you think about it, AT&T is better off without being the only carrier with rights to the iPhone as it gives them an incentive to diversify their selection, offering the consumer more. With Windows Phone 7 targeted at enterprises, the iPhone targeted at the young, casual smartphone user, and Android devices completing the circle, AT&T almost seems better than ever. What do you think? Will AT&T be able to recover from losing exclusive rights to the iPhone? Will Verizon truly offer a better experience than AT&T? Let us know in the comments below.